Well, this is a bummer. 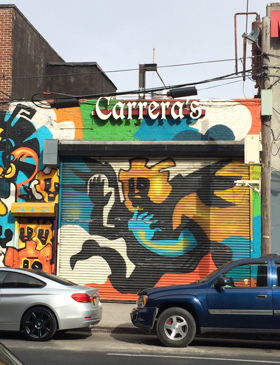 One of our favorite Spanish spots, La Churreria, has called it a day. Just a month after we got all excited about a menu makeover that brought churro cups into the mix, the three-year-old sister restaurant of neighboring Socarrat has “closed for renovations,” per a Facebook message. But don’t get it twisted, heart-shaped churro fans: the Nolita cafe isn’t coming back. An inquiry reveals the ownership will be “launching a new concept,” with details coming soon. You can still walk down to Despaña for something close to the Spanish-style sandwiches that La Churreria served. But why did this have to happen when churros were finally going viral? You may have been shocked to see David Letterman’s entire set hauled into a dumpster the day after his final episode aired, but it came as no surprise to Eva Radke. During her 15 years in the film and television industry, she saw plenty of perfectly good stage materials thrown into the trash heap.